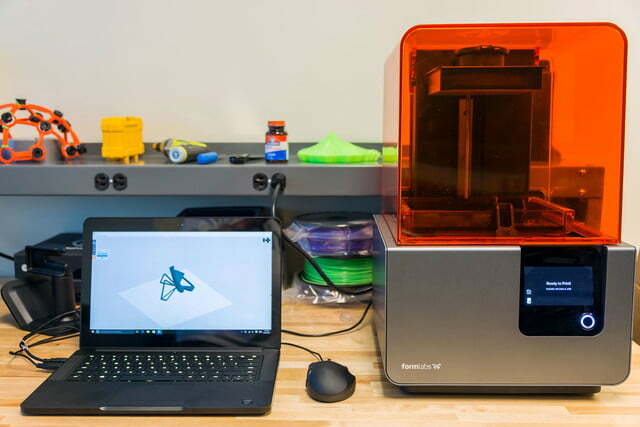 The user-friendly Form 2 3D printer is miles ahead of the competition. In 2013, a little-known startup by the name of Formlabs made a huge splash on Kickstarter with the release of a groundbreaking new 3D printer. At the time, this printer (called The Form 1) was one of the first consumer-oriented stereolithography (SLA) printers the world had ever seen – instead of creating objects by squirting molten plastic through a nozzle, it used a laser to ‘grow’ objects out of a pool of photo-reactive resin. The Form 1 ended up being a massive success on Kickstarter, gathering up nearly $3 million before the campaign concluded. Now, the company is back with a new and improved SLA printer that’s poised to take the 3D printing scene by storm yet again. The Form 2 is a beast. It’s not just a small upgrade like the Form 1+ was — it’s a complete and total overhaul. Formlabs has basically taken all the flaws and shortcomings of the first-gen printer and systematically addressed them through a series of major design changes. With a build envelope that’s 5.7 × 5.7 × 6.9 inches, the Form 2 can print objects roughly 40 percent bigger than its predecessor, the Form 1+. It’s not huge by any means, and you’ll still get more build area for your buck with a conventional fused deposition modelling (FDM) printer, but it’s definitely an improvement, and currently one of the largest build areas you can get in a consumer-level SLA printer. It’s also quite a bit faster than the first generation — somewhere around 30 to 40 percent. This speed boost comes from the machine’s more powerful laser, which solidifies the photopolymer resin about 50 percent faster, and with more precision. Why does a 50 percent more powerful laser only translate to 30 to 40 percent faster printing? Formlabs also changed the printing process. After each new layer is created, the Form 2 performs a “slide peel” to detach the newly-formed layer from the print bed, and then runs a wiper blade through the resin tray to remove any hardened particulate that may have been left behind. While this makes the printer a bit slower than it would be otherwise, it also makes it dramatically more reliable and far less prone to printing errors. 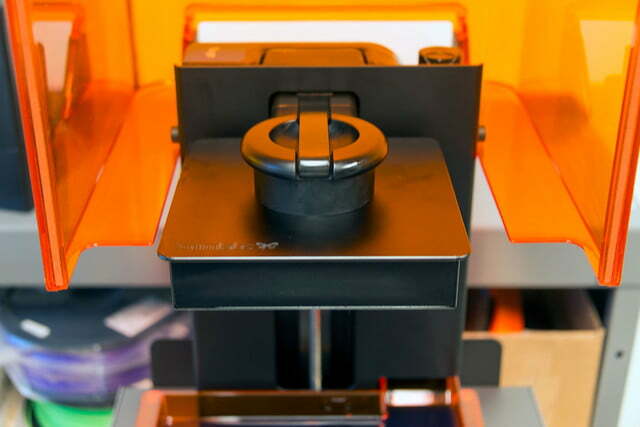 A myriad of little interface and usability upgrades also make the Form 2 easier to use. 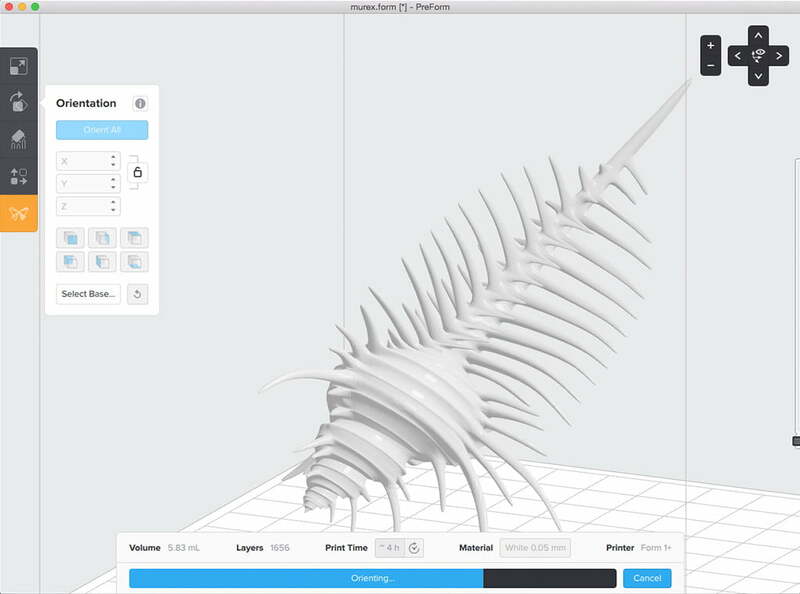 To change settings on the Form 1, you had to connect a laptop running Formlabs’ PreForm software. With the Form 2, everything can be controlled right from the printer’s big, beautiful touchscreen, right on the machine. You can connect it via Wi-Fi now, too, rather than USB. 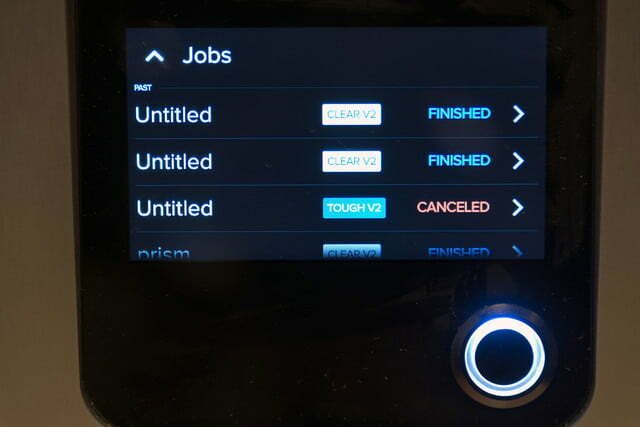 Along with Formlabs’ accompanying mobile app, this connectivity makes it possible for the printer to send alerts when your print starts, finishes, or requires attention. Despite the fact that the Form 2 creates objects in a fundamentally different way than a filament-based 3D printer, its setup process more or less follows the same set of steps. Step one is loading the printing material. It used to be that you poured sticky resin into the tray, but with the Form 2, you simply grab a resin cartridge, slide it into the slot located at the aft of the printer, and then pop open the top to allow airflow. That’s it. The Form 2 takes over from there. Step two is leveling the machine. A special disc-shaped tool allows you to adjust the individual height of each of the printer’s four feet. While you do this, the printer’s touchscreen displays the digital equivalent of a circular bubble level using internal sensors to guide you through the process. When you hit the sweet spot, the Form 2 will know — so if you set it on a perfectly level to begin with, you might not even need to complete this step. All in all, this is one of the simplest setup processes we’ve ever experienced with a 3D printer. If you know how to use a touchscreen and follow basic directions, you’ll have no trouble whatsoever. In terms of design, the Form 2 is arguably the most thoughtful, user-friendly SLA printer on the planet. It’s not just a minor, evolutionary upgrade from the first generation — it’s a complete overhaul that’s intentionally designed to address all of the major pain points associated with SLA printing. 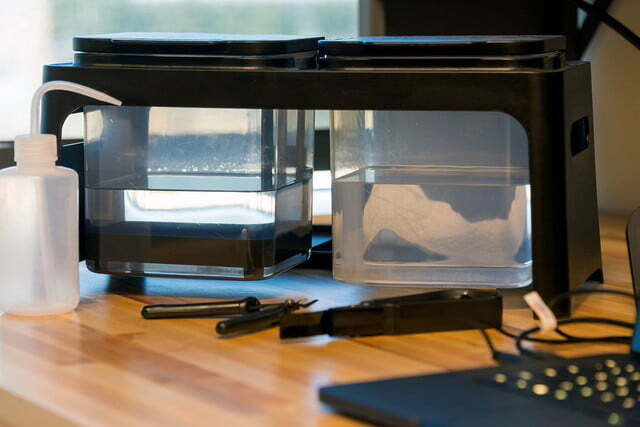 In Formlabs’ first-generation printer, creating large objects was a bit of an issue, since the printer had to be stopped periodically and have its resin tank replenished. 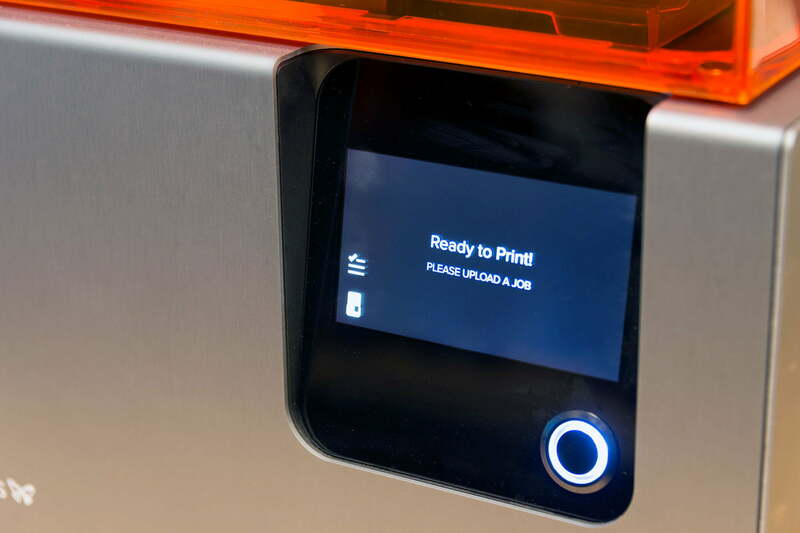 The new cartridge-based system allows the printer to refill itself automatically as needed. Another issue that plagued the first generation was dealing with leftover resin chunks that might be floating around in the tray. Before you started each new print, you had to be diligent and make sure that there were no particles left over that might screw everything up. 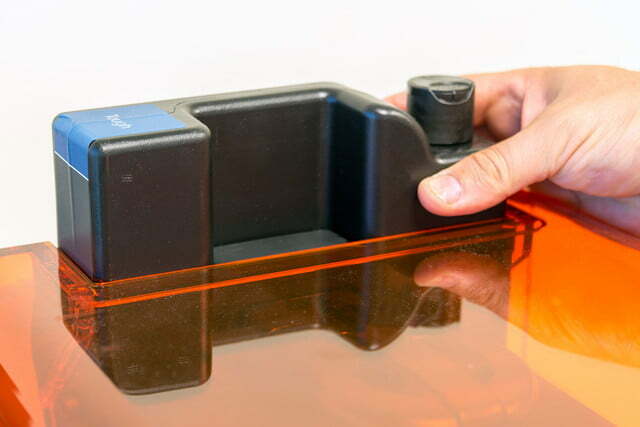 In the Form 1+, this meant opening up the printer and running a putty knife through the tray — but the Form 2 actually comes with an automated tray wiper that automatically clears the tray after each layer is completed. This greatly reduces the chances of getting a misprint, which ultimately makes the printer more reliable and easy to use. In generation one, you had to be extremely careful about spills. One stray gob of resin could fall into the printer’s innards and ruin the optics — but in the Form 2, the printer’s guts are completely sealed off. Formlabs is way ahead of the game here. The list goes on. Formlabs thought of everything in the Form 2 — even things that happen after your print is complete. It used to be that finished prints were difficult to remove from the build plate because they fused to the metal so strongly, but in the Form 2, Formlabs added an ingenious solution. Now, the printer’s auto-generated support structures are built with a small lip along their base, which allows you to easily pry them off with a special tool that comes with the finishing kit. Simply put, Formlabs is way ahead of the game here. It’s addressing problems that other SLA printer companies have barely even encountered yet, let alone begun to fix. The design of the Form 2 isn’t just good — it’s progressive. It raises the bar for any newcomers hoping to compete in the SLA 3D printer space. This is how it should be done. 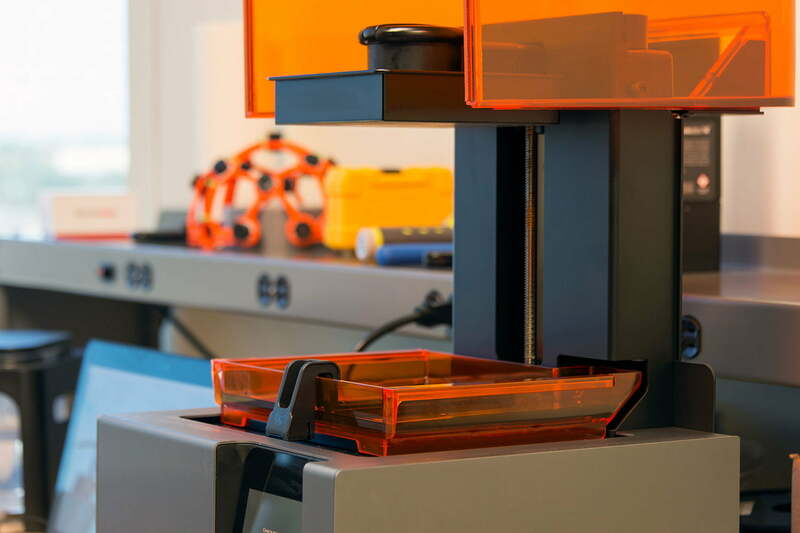 The Form 2’s onboard software and touchscreen interface are remarkably simple, but the UI you’ll interact with most is PreForm — Formlabs’ proprietary slicer/editor program. Aesthetically, it looks about the same as it always has, but a few new features tucked away inside the program make it more powerful than ever before. For instance, PreForm’s improved print optimization software helps you orient your object so that it prints smoothly: Just click one button and the program will analyze the object and choose the best position and orientation for you. 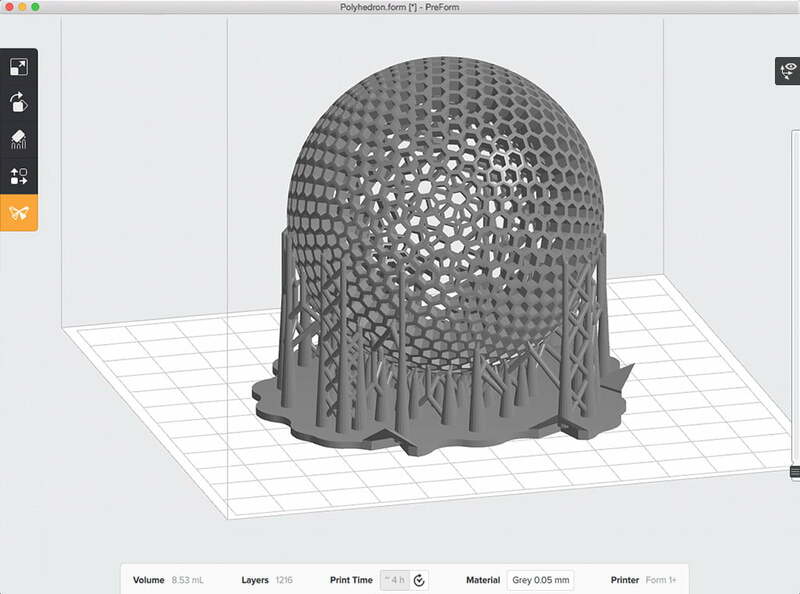 Support structures work the same way: One click will auto-generate support scaffolding to ensure that your print doesn’t fail. This feature was available in earlier versions of the software, but in the new-and-improved program, users can now add or remove support structures from any given area. This is especially handy since the auto-generated supports aren’t always located in the most convenient spots. 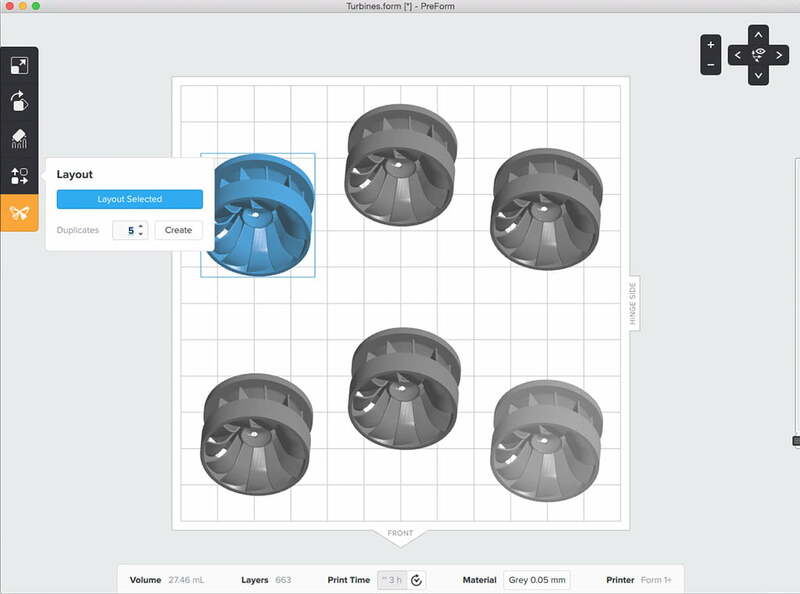 The best part is that FormLabs has implemented these new features and improvements without adding any extra clutter or complexity to the program’s user interface. The latest version of PreForm is just as simple and approachable as it was in earlier iterations, which we appreciate. The Form 2 is, hands down, one of the most detailed and dimensionally accurate printers we’ve ever used. The resolution is so good, you can barely see layers. Fine details come through in ways that FDM printers can only dream of. Bridges and unsupported spans? No problem. Tiny objects with extremely precise dimensions? Bring it on. It’s one of the most detailed and dimensionally accurate printers we’ve ever used. As usual, we ran it through a series of torture tests to determine the printer’s limits. The first one we did — the 3D Benchy test, came out nearly flawless. The dimensions were perfect on practically every surface, and the only imperfections were the nubs left over from the support material, which were minimal compared to what’s left behind on most FDM printers. Basically every object we threw at it was reproduced with near perfection. We experienced a few misprints at one point, but that was only because we attempted to print without adequate support structures. 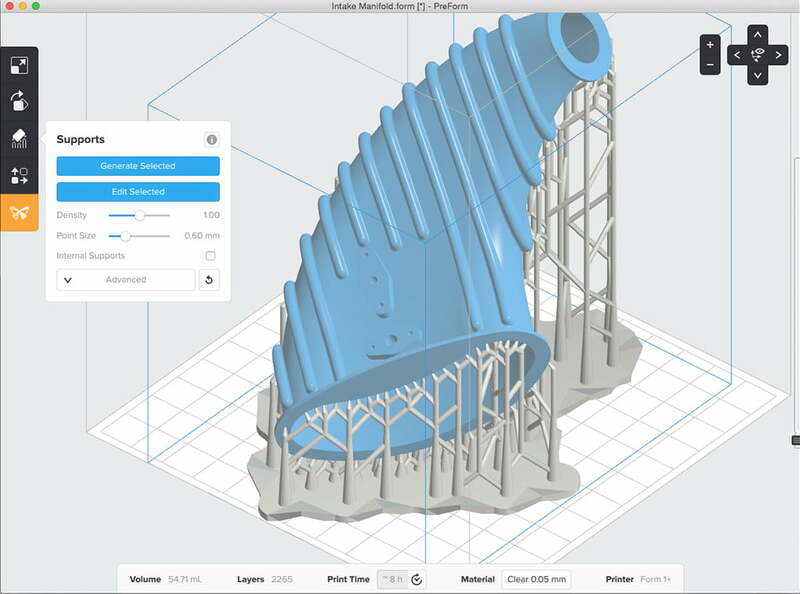 As we mentioned earlier, Formlabs’s new-and-improved slicer software allows you to adjust the size, shape, position, and location of the auto-generated support structures; as we found out, if you stray too far from the recommended settings, problems can sometimes occur. Making them too small or sparse often leads to misprints, but we never ran into any problems when we stuck to the machine’s recommended parameters. The only downside of this printer is the same downside that you get with other SLA printers: dealing with photopolymer resin is a pain. 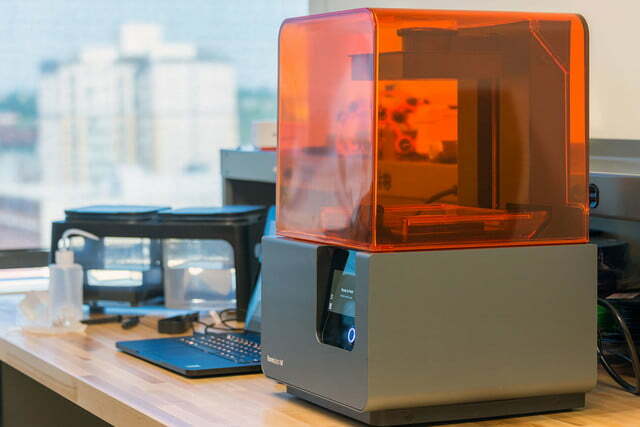 It’s sticky, it’s messy, and it stinks — but Formlabs has made dealing with it about as painless as possible in the Form 2. 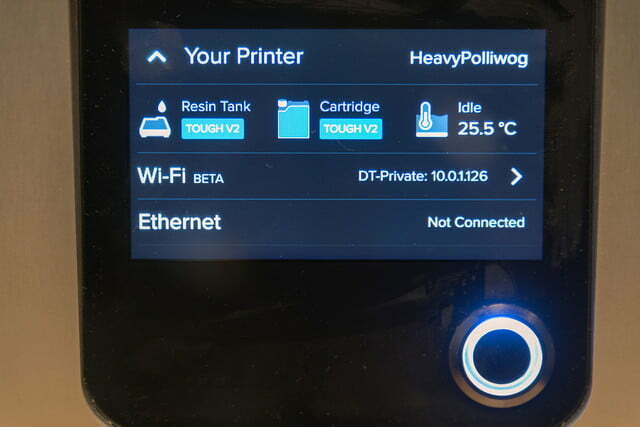 Thanks to the aforementioned design changes, you no longer have to pause prints to refill the resin tank; struggle to remove resin-covered prints from the build plate; or worry about dripping resin into the printer’s optics. It’s far less of a hassle to use and maintain. That said, you’ll still have to clean up the occasional drip or spill, and finish all your parts with a 20-minute soak in isopropyl alcohol. 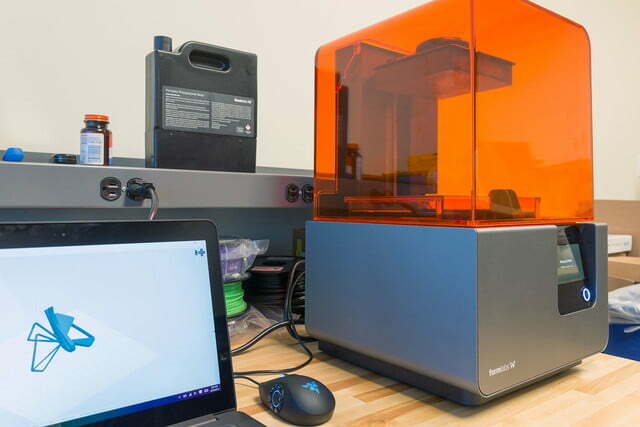 Using an SLA printer isn’t nearly as easy as the “grab and go” experience offered by filament based printers — but the Form 2 is about as low-maintenance as an SLA printer can conceivably be. You can’t easily repair or upgrade the Form 2 yourself, but in all fairness, that can be said of practically any SLA printer. Due to the nature of their construction and operation, they’re not quite as simple to repair as your average FDM printer. 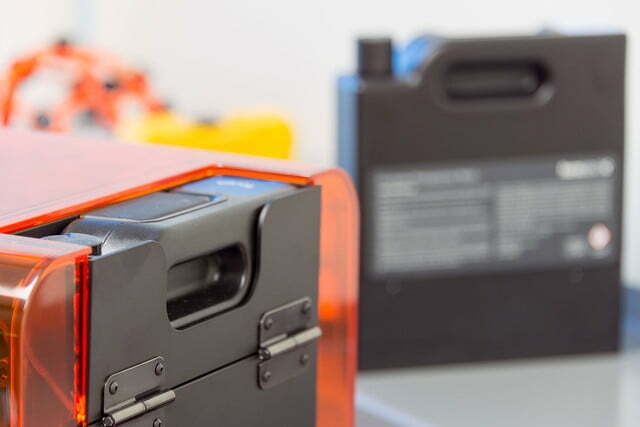 If something goes wrong, you’ll need to ship it back to Formlabs and wait for a technician to diagnose the problem — but the good news is that Formlabs has an entire team dedicated to just that, so you’ll always have support in that regard. The Form 1 made the case for at-home SLA 3D printing, and the better-in-every-way Form 2 is driving it home. The short answer is “No.” The Form 2 is, without a doubt, one of the best 3D printers we’ve ever had the pleasure of using. It excels in nearly every category, and features a litany of user-friendly features that you simply can’t get with other SLA printers. 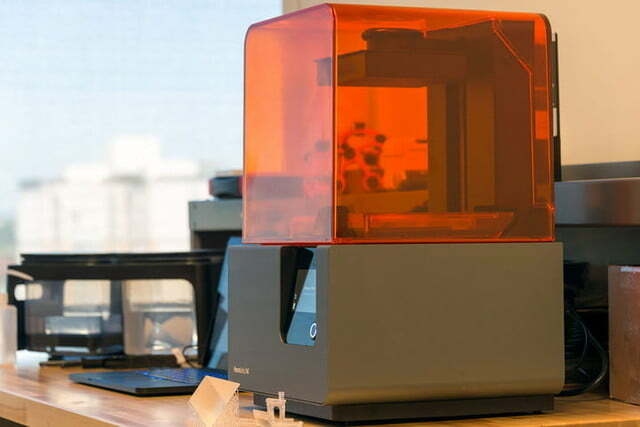 Formlabs has raised the bar with this machine, and competitors should take note. This is how SLA printing should be done. The longer answer is “Maybe.” Whether or not there’s a better alternative to the Form 2 largely depends on what you’re looking for. SLA printing isn’t necessarily the best option for all prototyping and printing needs, and if you don’t actually need solid, perfect parts, then perhaps an FDM printer would be more effective. If that’s the case, you should check out the Ultimaker 3. It’s in the same price range, boasts an admirable maximum resolution, and comes with a build envelope that dwarfs that of the Form 2. It’s also worth noting that since this printer was released, a handful of budget-friendly resin printers have sprung up. The Form 2 is still the best of the bunch in 2018, but it’s not the only game in town anymore. One notable contender is the Anycubic Photon. Despite costing just $500, it produces objects with comparable quality (though not quite as good!) as the Form 2. If you’re buying on a budget, you’d be wise to check it out. A few years, probably. The hardware and capabilities of this machine will inevitably be surpassed as newer, faster, and better printing technologies trickle down and find their way into consumer-level printers, but even when this thing gets overshadowed, it’ll likely keep printing like a champ. 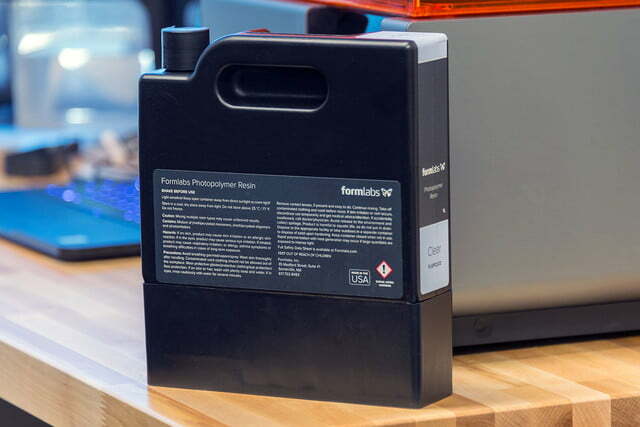 Formlabs regularly pushes firmware updates and software upgrades, and has a dedicated support team ready to help out if any hardware issues should ever arise, so you should expect a fairly long usable lifespan. Yes. it’s certainly a bit on the expensive side, but if you have the budget for it and want high quality printed parts, this is most definitely the printer you should buy.